Chinese society is on the verge of a structural transformation even more profound than the long and painful project of economic rebalancing, which the Communist Party is anxiously beginning to undertake. China’s population is aging more rapidly than it is getting rich, giving rise to a great demographic imbalance with important implications for the Party’s efforts to transform the Chinese economy and preserve its own power in the coming decade. 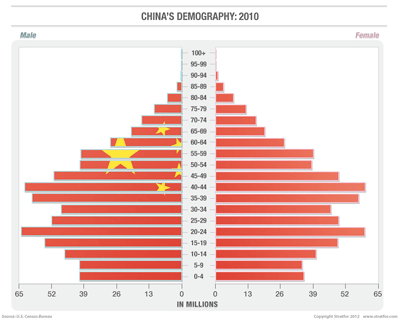 Two reports in Chinese media highlight different aspects of China’s unfolding demographic crunch. The Ministry of Education reported Aug. 21 that more than 13,600 primary schools closed nationwide in 2012. The ministry looked to China’s dramatically shifting demographic profile to explain the widespread closures, noting that between 2011 and 2012 the number of students in primary and secondary schools fell from nearly 150 million to 145 million. It also confirmed that between 2002 and 2012, the number of students enrolled in primary schools dropped by nearly 20 percent. The ministry’s report comes one day after an article in People’s Daily, the government newspaper, warned of China’s impending social security crisis as the number of elderly is expected to rise from 194 million in 2012 to 300 million by 2025. The Communist Party is already considering measures to counter, or at least limit the short-term impact of, demographic changes in Chinese society. On one hand, the Party continues to flirt with relaxing the one-child policy in an effort to boost fertility rates, most recently with a potential pilot program in Shanghai that would allow only-child couples to have another child. On the other hand, the government has proposed raising the national retirement age from 55 to 60 for women and from 60 to 65 for men. If implemented, this would bring China’s retirement policy more in line with international norms and delay some of the financial and other social pressures created by the ballooning number of retirees dependent on government pensions and the care of their children. 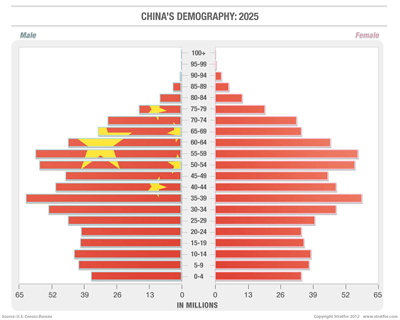 But even sweeping adjustments to the one-child policy or the national retirement age would create only temporary and partial buffers to the problem of demographic change. It is no longer clear that the one-child policy has any appreciable impact on population growth in China. China’s low fertility rate (1.4 children per mother, compared with an average of 1.7 in developed countries and 2.0 in the United States) is at least as much a reflection of urban couples’ struggles to cope with the rapidly rising cost of living and education in many Chinese cities as it is of draconian enforcement of the policy. Likewise, lifting the retirement age by five years will only partly delay the inevitable, and in the meantime it will meet stiff opposition from an important constituency of professionals, including many civil servants. In adjusting the retirement age, the government also risks aggravating an employment crisis among the rapidly growing population of unemployed college graduates in cities, many of whom are looking to filter into the employment ladder as elderly workers exit the workforce. In this context, the Communist Party must weigh policy adjustments carefully — any change it makes in one area is likely to create new tensions elsewhere in the workforce. 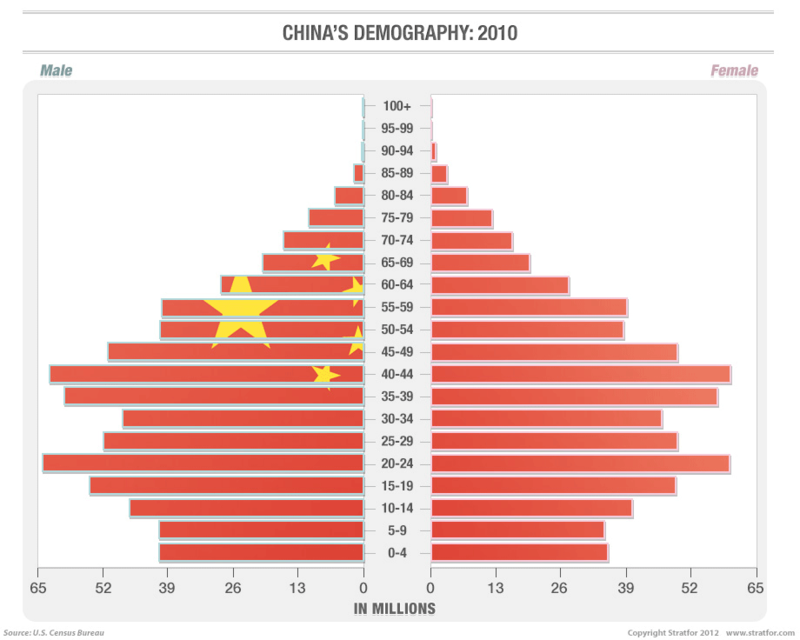 The crux of China’s demographic challenge lies in the fact that, unlike Japan, South Korea, the United States and Western European countries, China’s population will grow old before the majority of it is anywhere near middle-income status, let alone rich. This is historically unprecedented, and its implications are made all the more unpredictable by its coinciding with the Chinese economy’s forced shift away from an economic model grounded in the exploitation of inexhaustibly cheap labor toward one in which young Chinese will be expected to sustain the country’s economic life as workers and as consumers. A temporary reprieve from the demographic crisis will be difficult but possible with reform, but a long-term solution is far out of reach.